Have you ever looked at the ingredient’s list on gluten free bread and wept for just a simple bread with flour, water,salt and yeast? It seems impossible to achieve and although there are now some amazing gluten free breads on the market including Genius, NewBurn BakeHouse and M&S gluten free bread, these all contain xantham gum, methyl cellulose and mould inhibitors. M&S at least was one of the first to swap the xanthan gum for the much more natural physillium husk which I applaud. But I really do mourn the loss of simple bread. Well there is hope for you wheat allergics out there. Not being a coeliac myself I can eat rye bread and oats and have discovered some really lovely, organic and simple tasty breads on the market. You may not find them in supermarkets but some of them are stocked in even my local Budgens and the big 5. I find that the processed gluten free breads are alright for a special treat but if I eat them regularly they cause me eczema and nodular prurigo symptoms, as many processed foods do, even freefrom processed foods. I don’t know exactly which ingredient disagrees with me but I suspect it’s either xanthum gum, calcium propionate or the other mould inhibitor products that the gluten free bread manufacturers have to use in their bread. So being a simple soul I have a few favourites which, when I can get hold of them, are my staple breakfast and lunch saviours. If I can’t find them I’m quite happy with Nairn’s oat cakes for breakfast – they go great with marmalade and pot of coffee. So here is my roundup of alternative healthy wheat free and dairy free breads. They are also all egg free too which is useful if you also have an egg allergy. I’m lucky I can eat cooked eggs with no problem and even sometimes fried eggs if I keep my egg eating in moderation. I love the bread from the Artisan Bread company. None of their products contain baker’s yeast, sugar, enzymes, Xanthan gum, GM, eggs, dairy or cholesterol. They do a variety of different breads which come in little mini loaves which you can slice into two for the perfect sandwich. At the moment I’m eating the Organic Oatie breakfast loaf which includes the following ingredients: Gluten free oat flakes (62%)*, filtered revitalised water, rice leaven*, sea salt, seaweed (fucus vesiculosus bladderwrack)* *=organic. It’s great just as bread, brilliant toasted, though like many gluten free breads may take a little to toast than normal bread. I took some with me to restaurant last night and they provided me with my own oil and vinegar to dip. My friends both tried a bit and said they thought it was delicious. I buy in bulk, freeze and defrost as I need it. I have been enjoying the Village Bakery rye breads now for years and just recently I’ve been finding them fresh on the shelves in my local Budgens which is fantastic, before I’ve had to find a Waitrose or buy online. These are obviously not suitable for anyone with coeliac disease as they contain rye but if you have a wheat allergy or intolerance it’s great. It’s just so simple, the ingredients for the Rossisky rye bread loaf are: Rye flour*, water, sea salt. Rye flour contains naturally occurring yeasts. *Organically produced. That’s just three ingredients. Pretty impressive huh? This bread is not quite so good in a sandwich but is amazing toasted or as an open sandwich. You need to enjoy rye bread and it is an acquired taste but I love it with smoked salmon or humous. It comes in 400g and 800g loaves and they also do one with coriander seeds on top. nb. The Village Bakery also make some very nice carrot and lemon cakes which are also wheat free and dairy free but do contain egg. 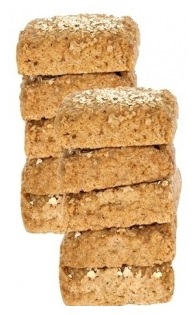 They also make some very tasty Four Fruit and Four Seed bars for snacking. Finally, not technically traditional bread, but The Venice Bakery make the most amazing pizza bases and flat breads which are gluten, wheat, dairy AND egg free. They are delicious and come frozen so you just have to cook them when you need them. I have cooked up a batch of the flatbreads and eaten them for lunch, dipped in oil or humous or made into a rustic sandwich. 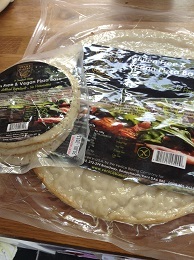 I have just spotted on their website that they also make tortilla wraps. The ingredients of the small plain pizza bases are: Rice Flour, Tapioca Flour, Potato Flour, Olive Oil, Fresh Yeast, Water, Sugar and Salt. That’s pretty simple and also the product is pretty impressive. They are also brilliant cold the next day. The bases can go a bit soggy in the middle of you overload the middle of the pizza with toppings before cooking but this happens with any pizza my husband has too often. 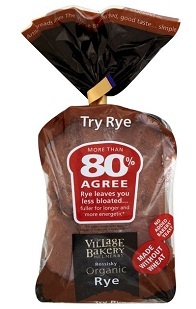 You can also find Barkat and Biona rye breads which come in long slim packs and are usually pre-sliced. These are much more dense than the Rossisky loaves and tend to crumble more. I do buy them, they have been a life saver before, but they’re not my favourites. I have also discovered The Wheat Free Bakery based in Scotland. They have quite a range of very good bread available to order online, however they do use the mould inhibitors I so despise, but do use the nicer psyllium husk in favour of xanthan gum so are slightly nicer ingredients. Has anyone else discovered any other really simple, organic, tasty wheat free bread? Any had success baking at home? Something I really want to try experimenting with when I have time.